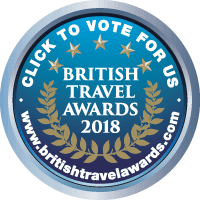 Hebridean Island Cruises has been nominated for the following categories in the prestigious 2018 British Travel Awards (BTAs). The winners will be determined by the consumer, who has until 1st October to cast their vote, with the successful companies announced at the BTA Gala Awards Dinner, being held in London on 28 November 2018. "We are thrilled to be nominated in the prestigious BTAs once again which is testament to the hard work and dedication our staff, both on board and ashore, have given to the company over the past twelve months. We are committed to providing the best possible cruise experience for our guests and to be nominated in this way is a true accolade and reward for everything we do. I hope as many of our guests will take this opportunity to cast their votes to help us secure a win." "The British Travel Awards give you the opportunity to reward travel and tourism enterprises for outstanding performance in service delivery and product offering. Voting in the 2018 Awards is now open and nominated companies have until 30th September to lobby their happy customers for votes – good luck to Hebridean Island Cruises." The British Travel Awards are considered the benchmark for excellence when it comes to finding out who really is the best in the travel industry. The British Travel Awards is a proudly independent organisation, verified by leading global business practitioners, Deloitte.